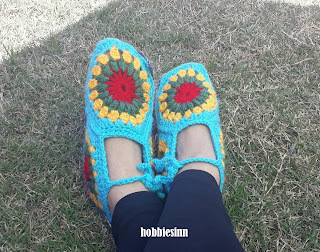 HOBBIES INN: DIY Starburst boots. 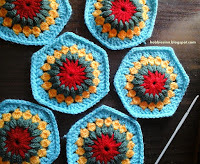 So here we are again with the granny hexagon post. This time we are joining them to make a boot from them. It's colorful, super easy and super cute. We will need 6 granny hexagons and 2 slipper soles to complete this boot. I have already uploaded detailed tutorials for both of them. Click on the pictures below to get to them. Step 1: Take 3 hexagons and join them in a way as in picture below. Step 2: Put this arrangement on the slipper sole and stitch them as shown in picture. the black dotted line joins with the edge of the sole. and the white lines joins together to form the back of the boot. Step 3: This is how it will look from the side. 1 hexagon will cover the foot and 2 others will cover the ankles. Step 4: Make a row of single crochet over the rim of the boot and if you wish you can make a string and tie them up when you wear these classy boots. Leave your comments and tell me what you think about this pattern. Thank you and keep crocheting.